Sometimes, breakfast should start out with a key ingredient. Today, it's roasted red peppers. I picked some up the other day at the Kroger cold bar wondering what I would do with them. Well, Here's what you do. Julienne them, and add them to a shrimp and chipotle jack omelet. Oh yeah! 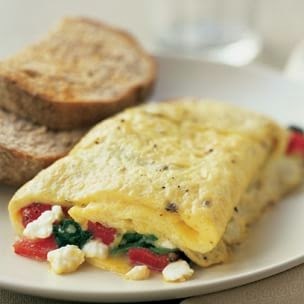 Make the omelet Julia Child style, as we always recommend. For the omelet stuffing, wash about 1/2 pound of pelt, deveined shrimp in lemon and sauté in butter and olive oil in a hot saucier. Add diced white onion, italian seasoning, salt and pepper. After about 5 minutes, add about 3/4 cup of heavy whipping cream and bring cream to a boil. Then, add about 1/2 cup of chipotle jack cheese diced into 1/2 inch cubes and the julienned peppers. When the cheese has melted, add to the center of an omelet and serve hot. Yum! $10 for ingredients.